What is Nigeria’s biggest problem? What is the single factor responsible for the myriad of socio –political and socio - economic problems Nigeria is faced with? Recently, I attended a social event and the main theme was discovering Nigeria’s problems and how the youth could engineer solutions to our various challenges. Speakers included senior lawyers, politicians, former and current senior security personnel and members of the civil society. I watched as each speaker put the blame on the other, the police blaming the politicians and elite of the society, politicians blaming former elected government officials and only a few accepting the blame for our country’s woes. I sat and listened, knowing that though there were little atoms of truth in their individual arguments, all of them had missed the mark and were off tangent. Our problems do not stem from the political class or from the security agencies or even past presidents and political parties. Our problem lies with every single Nigerian that make up of the over 180 million of us. Now, do I sound like I am off tangent myself? Follow me a bit more before you totally judge. What I now know to be the greatest Nigerian problem, I discovered sometime in 2013 and it came to me during the normal course of my day but while I was on foreign soil. I was living in London at that time while studying as an international student for my LL.M in International Business Law at the University of Bradford. On this jolly good day, I was walking into a building and to my surprise, the person ahead, held the door open for me. As little and inconsequential as this act was, it caused a stir in my heart. This person did not know me, had never met me, was not going to get anything from me and would probably never see me again but was kind enough to hold the door for me. This single act was of mindfulness was so strange that it changed something inside me. In a place like Lagos where I was coming from, this act of kindness was very weird. It had never happened to me before. Where I came from, the person ahead of me at the door would not have cared if the door hit me in the face, would not have looked back for one second to be mindful of me but would have walked on and if the door had hit me on the face, I would have had no cause for complaint as everyone would have asked me one question “wetin you dey look” or in other words “why were you not paying attention to the door” or better still “am I your door man”?. If you are reading this post I am sure you must have had a similar experience before. Ever since that day, I have always held the door for anyone coming behind me because I later got to notice that it was the norm in my new environment. It was a culture to be mindful of others, a culture of respect. Do we have a similar culture in Nigeria? No way. In Nigeria, the culture can be described in one sentence, “GET WHAT YOU CAN, WHILE YOU CAN, NO MATTER WHO BEARS THE CONSEQUENCES OF YOUR ACTIONS”. 1. A politician can amass so much stolen wealth from the public purse and damn the consequences. 2. A fellow driver in traffic will not allow you cut into his lane. 3. Some youths are involved in online scams reaping innocent people off their life savings. 4. Herdsmen will attack the farms in other communities, have their cows eat up the crops and kill the farmers who complain or challenge them. 5. Policemen will assault, intimidate and extort citizens. 6. Tribes would be at each other’s throats crying about marginalization and each President or Governor will be expected and seen to cater to only the needs of his local government or tribe. 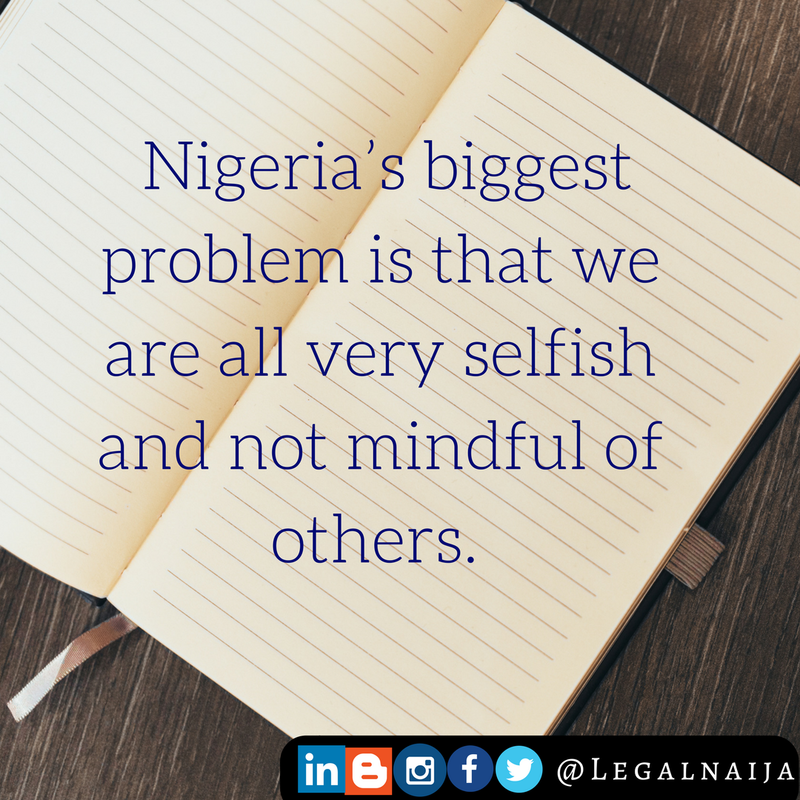 Nigeria’s biggest problem is that we are all very selfish and not mindful of others, we do not respect others rather we focus only on thinking about ourselves, our egos, our families, our purses and our wants. Take something as simple as holding the door for the person coming after you, no way; we are too busy going ahead with our personal agendas. We deliberately do the wrong things to make life difficult for everyone else and its like that with everything. You cannot feel like royalty, because people will not serve you with a smile and warmth. You patronize a business and you wonder if they made a corporate decision to throw good customer service out the window; the culture of disrespect creates an unsafe environment, you cannot leave your phone, laptop or valuable in a busy place and come back to find it, it will have been stolen, even in churches. You can park your car outside and it may not be there when you get back or you may return to find its window broken and your valuables gone. The solution to Nigeria’s problem is to cultivate a society where people are mindful of others and life will be better for everyone. It’s a lesson, Nigeria must learn from the rest of the world, if we must lead Africa and change the conversation.